Lorenzo Isella, Mariateresa Romano, Alain Barrat, Ciro Cattuto, Vittoria Colizza, Wouter Van den Broeck, Francesco Gesualdo, Elisabetta Pandolfi, Lucilla Ravà, Caterina Rizzo, and Alberto Eugenio Tozzi. PLOS ONE 6(2): e17144. doi:10.1371/journal.pone.0017144, March 2011. Nosocomial infections place a substantial burden on health care systems and represent one of the major issues in current public health, requiring notable efforts for its prevention. Understanding the dynamics of infection transmission in a hospital setting is essential for tailoring interventions and predicting the spread among individuals. Mathematical models need to be informed with accurate data on contacts among individuals. We used wearable active Radio-Frequency Identification Devices (RFID) to detect face-to-face contacts among individuals with a spatial resolution of about 1.5 meters, and a time resolution of 20 seconds. The study was conducted in a general pediatrics hospital ward, during a one-week period, and included 119 participants, with 51 health care workers, 37 patients, and 31 caregivers. Nearly 16,000 contacts were recorded during the study period, with a median of approximately 20 contacts per participants per day. Overall, 25% of the contacts involved a ward assistant, 23% a nurse, 22% a patient, 22% a caregiver, and 8% a physician. The majority of contacts were of brief duration, but long and frequent contacts especially between patients and caregivers were also found. In the setting under study, caregivers do not represent a significant potential for infection spread to a large number of individuals, as their interactions mainly involve the corresponding patient. Nurses would deserve priority in prevention strategies due to their central role in the potential propagation paths of infections. Our study shows the feasibility of accurate and reproducible measures of the pattern of contacts in a hospital setting. The obtained results are particularly useful for the study of the spread of respiratory infections, for monitoring critical patterns, and for setting up tailored prevention strategies. 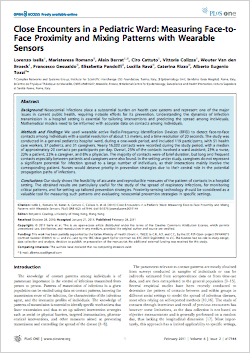 Proximity-sensing technology should be considered as a valuable tool for measuring such patterns and evaluating nosocomial prevention strategies in specific settings.